Food and beverage cartons are recyclable! Now that more than 60 percent of U.S. households have access to carton recycling, it is more important than ever to get on board. Still don’t accept cartons in your local program? According to a survey of American adults we commissioned, the majority (79 percent) always or occasionally recycle their cartons. Unsure how to begin adding carton recycling to your curbside program? Are you a facility that would like to start accepting cartons? If yes, the next steps may be simpler than you think. The Carton Council can help you get started and begin diverting cartons from landfills, while also creating a new source of revenue from the sale of this valuable commodity. If your community and/or facility already accepts cartons, we have materials to help you promote carton recycling to your residents, including our new community toolkit. Learn more about how cartons are helping Minnesota reach their 75% recycling goal by 2030 in the video below. 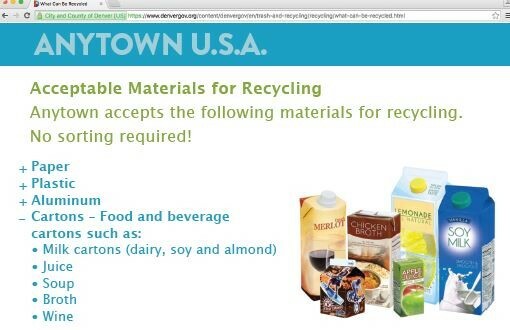 The first step to adding carton recycling in your local community is reviewing the resources we have. Click here to find a step-by-step guide of how to add cartons to your community recycling program, and here for adding cartons to your facility. You can also reach out to our team at info@recyclecartons.com with any questions you may have. We have team members with experience in working directly with Public Works departments and/or public and private run facilities. They can advise you on how you can best add cartons to your local program or facility. If you are a facility, we can help identify how you can best maximize from sorting cartons. By adding cartons to your curbside program, you can help divert more materials from the waste stream and create another source of revenue on the sale of recyclables. Plus, the addition of a new material to your program provides the opportunity to reinvigorate your community’s recycling efforts. Once food and beverage cartons are accepted in your facility and community, it is vital that residents are informed. Research reveals that recycling is seen as a local issue and using a variety of local communications is most effective. The first step is to make sure cartons are included in the list of accepted materials on the city and MRF website and any other place that talks about what can and cannot be recycled. List cartons as a separate category, just like you would paper, plastics, glass etc. Provide examples of products cartons are used for, including milk, juice, soup, broth, wine, etc. We have resources to help educate residents and promote carton recycling, including our best practices doc for communcating cartons to residents and our community toolkit, full of materials and creative to share on your website, social media channels and more. We’ve created a toolkit for communities to spread the word about carton recycling. The resources below contain fun and engaging content that you can share on your website, social media channels, email and more. Website Copy: Website copy and creative recommendations on correct and incorrect ways to describe cartons in your community. Social Media: Sample Facebook, Twitter and Instagram language and images that you can use on your existing accounts. Email: Content you can send to your network through email to promote recycling cartons. Press Release: Use this press release to tell your community that carton recycling is available in their area. Frequently Asked Questions: This FAQ sheet provides common questions people often have about what cartons are, why they should be recycled, and how they are recycled. Bill Stuffer: Research shows that including this bill stuffer in your community’s electricity bill or other direct mail is one of the most effective ways to communicate carton recycling. Download this bill stuffer and include it in next month’s utility bill. Myths vs. Facts one-pager: Five common myths about carton recycling are debunked. Recycle Your Cartons PSA Video: This educational video shows you how to recycle your cartons and the different types of paper products that cartons are transformed into. You can share this video on your existing accounts or send it to people in your area. Download this version if your community recycles plastics #3-#7. Download this version if your community does not recycle plastics #3-#7. In addition, we invite you to join our Carton Recycling Champions group on Facebook, where you can meet other avid recyclers and stay up-to-date on the latest recycling information.Thank you for spreading the word that food and beverage cartons are recyclable in your community!